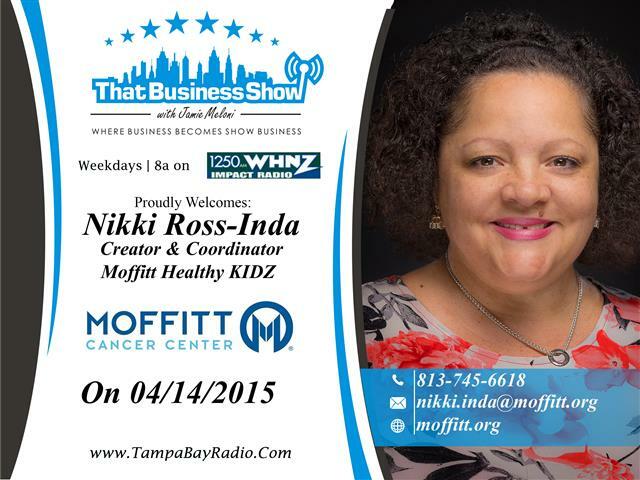 Nikki Ross-Inda joined me in studio today at the top of the hour to discuss Moffitt Cancer Center’s program, Moffitt Healthy Kidz. This is one of the many programs that make a difference in our community and was started by Nikki in 2008 as a way to help educated children on how to take preventative measures early in life to avoid cancer later in life. Since the inception of this program, 9300 youths and families have been educated on various topics stemming from the risk of smoking to healthy eating and proper Sun Protection. Nikki spreads the word through our school system and is frequently found on various news organizations talking about this program to increase awareness and garner involvement for the program. Moffitt Cancer Center is a Tampa Bay community leader and a leading cancer researcher in the Country and across the planet. Be sure to visit http://www.moffitt.org for more information on the Moffitt Cancer Center and to learn about all the community events going on around this organization including the upcoming Miles For Moffitt being held in conjunction with PNC Bank on Saturday May 9th at the University of South Florida. You can sign up to walk or run in this 10th annual event which aids in cancer research at Moffitt at their site. Nikki can be reached at 813-745-6618 or email at nikki.inda@moffitt.org for more information on Moffitt Healthy Kidz and the Moffitt Cancer Center events. 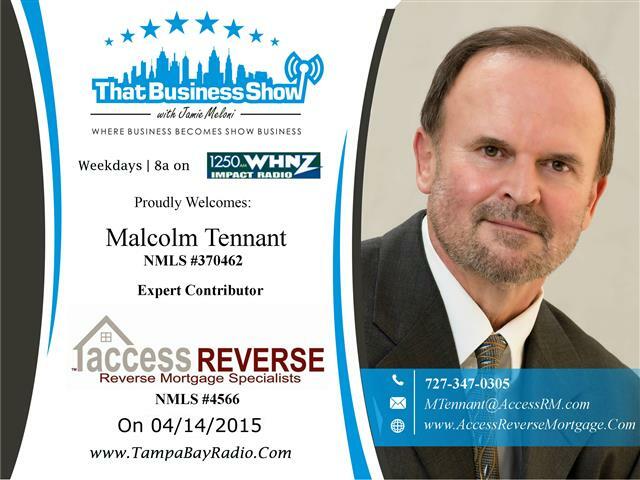 On the 2nd half of the show, Expert Contributor and Chief Operating Officer of Access Reverse, Malcolm Tennant, joined me in studio to talk about the Reverse Mortgage market and many of the myths that he and his company deal with on a daily basis. Access Reverse is a family owned local business that has been operating since 2005 and Malcolm and his team has overseen the funding of over 1200 Reverse Mortgages. They have a highly skilled and dedicated staff that deals solely in Reverse Mortgages so you get the knowledge and care you need from experts in the industry. Malcolm also spoke of his community involvement on the show and has been a Big Brother since the age of 18 and participates in overseas missions works and is an ordained deacon. He is actively involved with the Pinellas Board of Walk in an effort to end Alzheimer’s Disease, a disease that Malcolm and his family experienced first hand and of which he shares on this show. Malcolm recently became a contributor to a Boston College study on Reverse Mortgages and their book includes a chapter written by Malcolm Tennant that explains Reverse Mortgages in great and thorough detail. You can pick up a free copy of his chapter via this link https://docs.google.com/document/d/1-r0qiRnPEVCr9ERO45nBA5WoBDRPMsmgyD1UJz1Xggc/edit and you can get it for free at www.accessreverse.com. Malcolm is available at 727-347-0305 or email at mtennant@accessrm.com for help with all your Reverse Mortgage needs!